A long road trip in a small car requires careful planing. The limited space will not afford us to simply drag around unnecessary items as if we were covering the miles in a huge SUV. Our last cross country trip showed us of what was important and what would fit. As summer temperatures will be quite warm on this Southern route – light clothing is a must. Washing machines will be available so a limited wardrobe is possible. Luggage needs to be of the soft variety without bulky wheels, handles or frames so it can fit into the irregular shapes of an Alfa boot. Mounted on the dash in place of a traditional GPS navigation system the tablet computer makes it quite easy to follow our route on Google maps, look up points of intrest on the fly, avoid traffic, play music, and keep in touch via email and texts. I prefer the Google Nexus 7 for it’s low price, perfect size and good performance. Along with this; usb charger cables, 12v usb plugs. Tablets and modern smart phones require more power to maintain charge so look for 2.1 amp output and charge only usb cables. Google Navigation – for following our route on google with points of intrest. My Tracks – provides a recorded track of the trip including speed, elevation and travel times. Ulysse Speedometer – Keeps track of the miles per day and is an accurate speedometer. Rate Beer – local breweries and brewpubs are easy to find. Yelp – some food perhaps. Trip Advisor – sights we missed. Field Trip – pops up with sometimes interesting information about the area you’re in. Route Trip USA – Route 66 – includes Route 66 mapped out with points of interest. Route 66 (off line navigation app) – for times were there is no data. Google Music Player – pumped through our mono speaker. Light weight shorts, t-shirts and limited shoes/sandals. Driving shades, sun tan lotion and well secured hat if you are driving a convertible. This may seem like an unnecessary addition but with vast distances between proper coffee stops in the mid-west and it’s relatively compact size this is an worthy indulgence. 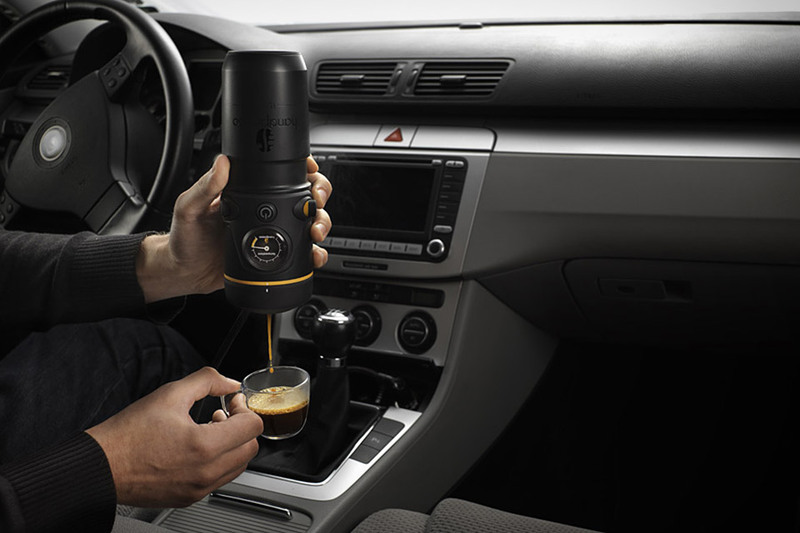 Handpresso makes a fantastic, well built little device that uses coffee pods and provides 16 bar of pressure. Spare parts In the event that a part fails it’s a good idea to travel some parts probably unavailable at most auto-parts shops; fuses, cooling hoses and spare fuel line. An extra fuel pump and perhaps a break system/clutch master and slave cylinder. For attaching those spare parts above; Tire pressure gauge, some wire, knife, assortment of wrenches, sockets and screwdrivers. Tape, rags, multi-meeter, glass cleaner. EZ66 Guide for Travelers – one of the best books on Route66 with good maps, directions and interesting facts. Do not forget our mascot, little Tioga bear..!